It’s taken several days to write this, but FINALLY on Friday, Oct. 22 I got the big, purple cast permanently removed from my leg. What a relief! 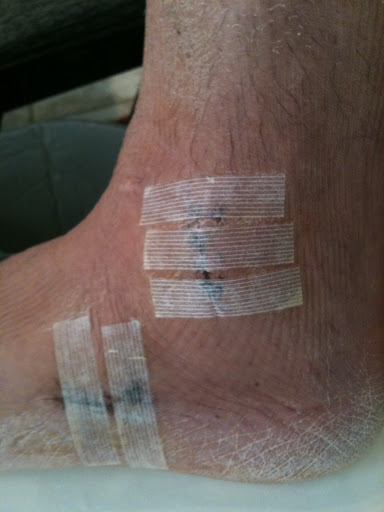 Here’s a pic immediately after removal. You should be warned that you are looking at a werewolf leg that hasn’t seen daylight in four weeks! Despite my Italian heritage, I NEVER expected to see that much hair. Even the doctor ordered me to go home and shave! My foot overall was pretty icky. Tons of cracked skin and still a little puffy and swollen. 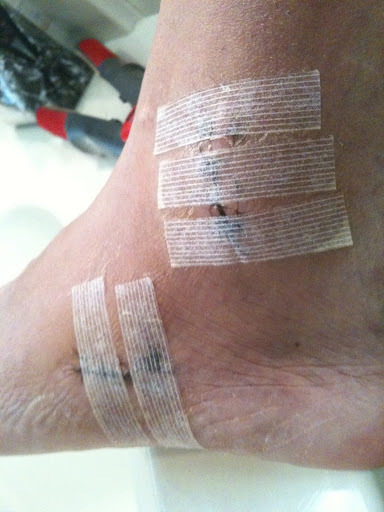 The incisions continue to gross me out. They are just scabby, grody, and soooo itchy! The pain from surgery is gone, but my foot and ankle have completely forgotten how to walk correctly. Even though it doesn’t hurt (per say) to step on it, it’s SO uneasy and weak that it scares the crap out of me. The diagnosis at the doc is the break/screws are healing exceptionally well. I’m in my friend, the moon boot, for two weeks and I have a lace up brace for after that. I start physical therapy in two weeks, which also frightens me. Even my doc said PT should be interesting considering my condition (read: knocked up), b/c they do lots of balance training. So, that should make for a hilarious post. I am so happy to be at this point (which seemed like I’d never get here). What an experience this whole thing has been. More belly pics to come and some fun-filled Halloween activities this weekend. And one last thing: GO RANGERS! YAY! Oh, I bet your foot/leg was so happy to see water, shaving cream, and lotion 🙂 And I bet you were so happy to see your foot!